Bangkok, Thailand -- While Buddhist teaching emphasises death and impermanence, it's not easy to set ourselves free from multiple cravings and the pleasures of a euphoric life. Death can come at any time, even without a warning, whether our own departure from this world or the loss of our loved ones. As much as sunset can be a beautiful sight, death can be positively viewed as a happy ending as it comes along with the cessation of suffering. Bangkok University Theatre Company attempts to bring us closer to an enlightenment of death as a truth of life through a contemporary Thai performance, Dear Death or Yern Phra Yom (Phra Yom or Yama, the God of Death). Following last month's enthralling performances at Singapore's Esplanade Theatre Studio, the theatre company will stage a bigger production of the show at the opulent Aksra Theatre, on March 28 and 29. Playwright and director Assistant Professor Punnasak Sukee continues to portray Buddhist philosophy in this story, after last year's Dancing to Nirvana delivered the key message of Ittappajayata, the concept of existence and uncertainty. Dear Death amplifies on this uncertainty with the theme Sabbe dhamma nalam abhinivesaya, meaning "Nothing, whatsoever, should be clung to." Looking younger than a fortysomething, Punnasak shares how he faced a mid-life crisis three years ago that had him questioning about whether what he was doing really served a purpose. He found an answer in Buddhist philosophies that are reflected in his works, the most prestigious being Mahajanaka The Grand Musical, to commemorate the 60th anniversary of HM the King's accession to the throne. "It may be because of ageing that got me deeper into dhamma. At any age, you can benefit from Buddhist teaching that gives you the 'how to' to cautiously lead your life and to find a 'way out' of suffering," he says. "But the difficult part of it is to put it into practice. Moreover, people may think it's about going to the temple, entering monkhood, or becoming a vegetarian when actually anyone can practise dhamma on a daily basis." Morananusati, an awareness of death, is one example of Buddhist mind-training to be mindfully conscious of its inevitability and be well prepared for it. "In reality, people may shun death, fearing it as a terrible fate and a horrible thing. Dear Death aims to turn this attitude around, to become proactive about dying. Essentially, if one can detach ourselves, it will come on easy and thus the Pali verse of Sabbe dhamma nalam abhinivesaya or 'Nothing, whatsoever, should be clung to' echoes throughout the play," says Punnasak. Dear Death tells the story of a man and his grandmother and their encounter with the God of Death. The young man, afraid that the elder will soon die, is in suffering due to his love and attachment to his grandmother. In his dream, he meets a kind-hearted god riding on an exquisite chariot to pick up people and transport them to eternal happiness. He's awakened to look at death, not from its dark side, but with an enlightenment that it's merely a part of a natural change. In the end, he readily accepts the loss of his grandmother, and with the uncertainty of life, he commits himself to doing good deeds. The thought-provoking story comes to life through an amalgam of acting, singing and contemporary dancing performed by 50 students of Bangkok University's Department of Performing Arts. Sophomore student Prayunsak Rattanaseranee takes the demanding leading role of the young man, who's virtually in every scene of the 90-minute show. Neeranuch Patamasutra, the only professional performer in the cast, plays his merry grandmother who's ready to let go and embark on her last journey. The God of Death characterised as 'He', performed by sophomore student Preechan Maneechote, appears on a man-powered golden chariot several times throughout the show. Repetitiveness of some parts of the story may have audience asking when 'He' will eventually take the grandmother to, supposedly, heaven. Overall, Dear Death presents contemporary Thai performing arts in a riveting way. The choreography by Parinya Tongphonthong boasts a contrast from vigorous contemporary movements in the "grasping and clinging" scene to nimble footwork of traditional Thai dancing by the God of Death and his entourage. Music composers Krisada and Napisi Reyes smoothly mixes traditional Thai and Western music, pali verses, traditional Thai chanting and opera singing for a stimulating score that expresses death in a sanguine rather than a melancholic spirit. With subtitles in English, Dear Death was immensely appreciated by a multi-national audience at Esplanade Theatre Studio in Singapore. Aksra Theatre, by far, will be a grander venue and its auditorium with carvings of humans, gods, and angels and a Six Heaven ceiling provides an ethereal ambiance for the performance. Even so, will it appeal to Thais? Contemporary Thai performances don't normally draw a big crowd but Punnasak optimistically observes an increasing number of theatre-goers who seek 'food for thought'. "This is a story that Thais can relate to and it offers an essence of Buddhist philosophy on embracing death besides the entertainment," he says. 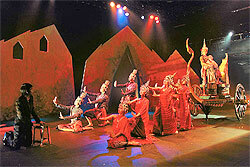 "In Thailand, contemporary Thai performances are like buds that are ready to bloom. Somehow they never get to bloom to the fullest because of the lack of support. Nevertheless, Bangkok University Theatre Company hopes to change that and keep this performing arts alive." Dear Death will be staged at Aksra Theatre, King Power Complex, Rangnam Road on March 28 and 29 with two performances each day at 2pm and 8pm. Tickets cost 1,000 and 1,500 baht. For more information, visit http://www.thaiticketmajor.com or call 02-262-3456.